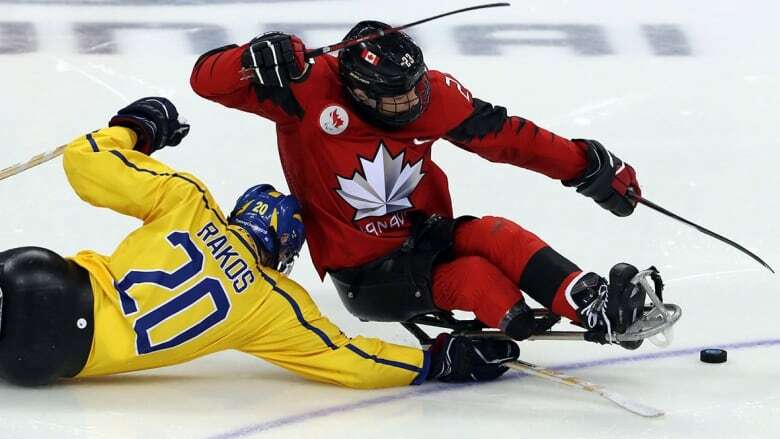 Liam Hickey is an indispensable member of Canada's para ice hockey team looking to win its first gold since 2006, but the 19-year-old from St. John's has had to make sacrifices just for the chance to compete at the Paralympics in Pyeongchang. Liam Hickey isn't your typical first-time Winter Paralympian. That's because he's already competed at the 2016 Summer Games in wheelchair basketball. That experience — along with a silver medal from the 2015 Parapan Am Games in Toronto — gives the 19-year-old from St. John's a degree of maturity and poise that belies his age. Hickey is "all-business" according to Canadian men's coach Ken Babey, something that becomes clear when he talks about living away from the team's core for long stretches. To compensate, he plays with his local team and trains on his own, but it comes at a price. "It's out of my own pocket," Hickey says, adding that ice rental costs him about $150 per hour. "I try to get three to four ice times a week, which is what the guys are getting here in Ontario, so it definitely adds up quickly." "It's one of the many sacrifices I've given. I don't mind doing that if it means I'm going to get better." Becoming elite at any sport requires sacrifice in some shape or form, and Hickey is seeing the payoff from this commitment in both his on-ice performance and the recognition of his teammates and coaches. "He has that competitive edge that we like, he brings that right away, he has an outstanding work ethic and he's a fast, skilled player," Babey says. "He's definitely a key member of this team and I think he will be too in the future." Hickey says he receives support from Sport Canada's carding system that allows him to keep pace with his teammates in Toronto while he's in the Avalon Peninsula. He needs to be on top of his game in order to fit in Babey's uptempo system, which demands that players be in peak physical condition in order to maintain a level of consistent speed over the course of a full game. "There's some science to what we're doing and it relates to being fit first," Babey says, referring to regular fitness testing that's been going on since last June. "If you want to play on this team, you're going to have to be fit because we see ourselves having to play maybe some tight games and winning those games late in the third period." The team has bought into the system, with captain Greg Westlake emphasizing the importance of this style of play in an increasingly competitive field following a bronze in Sochi. "We needed to get a lot faster, we needed to get in better shape, we needed to really push that fitness component," Westlake says. "The other teams are fast and they spend a lot of time working on skating, so to combat that we need to skate, we need to push our bodies as much as we can, so that's the goal with everything we do." Hickey joined the national team two years ago and is now an indispensable member of the team. "I think we all love playing together so it definitely makes it easier to develop the chemistry and come strong every game," Hickey says. The experience level on this Canadian squad varies tremendously; Westlake, Billy Bridges and Brad Bowden are the only remaining members of the 2006 squad that won Canada's lone Paralympic gold while Hickey is younger than Toronto Maple Leafs star Auston Matthews. That experience gap doesn't faze Babey, who preaches puck possession, collective support and being a "good team citizen." "[Hickey] suits our style of play and he's added another scoring dimension to our team so other teams can't just focus on certain guys anymore," Babey says. The youthful exuberance of this squad — 17-year-old forward James Dunn is the youngest Canadian Paralympian in Pyeongchang — reminds Westlake of his first Games as an 18-year-old in Turin. "There was a hunger in that team, because nobody had won before," Westlake says. "That same hunger is back, that same drive and it's exciting. I want to get a gold medal for a lot of these guys, I know they deserve it."